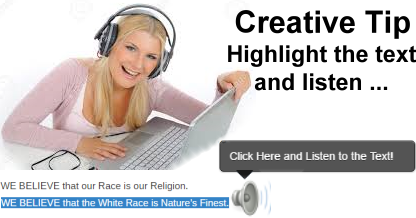 The White Race. White people are the creators of all worthwhile culture and civilization. Also, believers in our racial religion are called Creators. If you were to sum up the objective of your religion, Creativity, in one sentence what would that be? That objective would be: The Survival, Expansion and Advancement of the White Race. By Reverend Cailen Cambeul, P.M.